Why is my roof leaking? It was fine before! When we have days of rain in Central Texas, homeowners often discover they have leaks which haven’t shown up before. That can be caused by allowing leaf debris to build up in the valleys of your roofline, where water can seep in and rot the plywood deck beneath your shingles. In some cases, like against your chimney, the debris can come up over the flashing, which means water can trickle behind the metal weatherproofing and run down the chimney. It’s also the case that as trees overhanging your roof grow, they begin to rub the shingles. Wet leaves can weigh down the tree limbs, and high winds will push them back and forth constantly, until they rub a groove in the shingles, or even dislodge some shingles. A wind storm can pull off the cheap three-tab shingles that often cover entry-level homes…which is why roofers are so busy after a line of thunderstorms moves through. 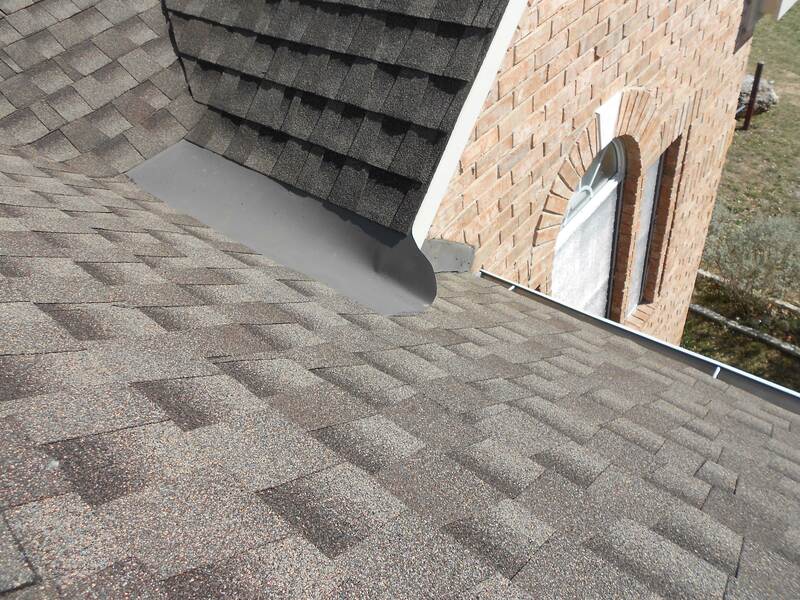 And if you have an older roof and it’s seen its share of hail, wind and rain, that’s damage that can fester, until days of rain creates failures in the shingle layer, with water soaking through the underlayment and seeping into your attic. An attractive roofline is a strong selling feature for a home, so often a builder uses dormer windows to add “curb appeal,” or a house has a complex layout, with rooms extending past the core of the house. Whether small or extensive, these features require that the separate sections of the roof be tied in together. One of the key differences between RoofCrafters and roofing crews who simply staple shingles all day, is that we understand the carpenter’s craft…so we know what to look for when we inspect a roof. This is probably a good time to point out that going with the cheapest price could be a mistake. Slapping tar paper down over rotted decking, especially in a valley, is not a long-term solution…and as you probably know, rotting wood is contagious. A porous deck means the rafters are getting wet, and if they rot, your roof structure can fail…not just the weatherproofing! This house had two steep roof sections come together to form a valley, with one section draining down onto another, before the water could slide down to the gutter. 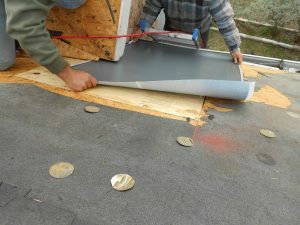 The original roofers hadn’t done a good job in selection of materials for the work, and the flashing was not secured in a way to prevent water getting beneath the shingles and underlayment. The result was a rotted deck and a significant repair job. Often, a builder is trying to trim costs, and the framing carpenters aren’t experienced enough to recognize a problem in the design, and the roofing contractor is trying to weather-in the new house as quickly as possible. Thus, shortcuts get taken, and it’s the homeowner who eventually must cover the cost of doing the job right. 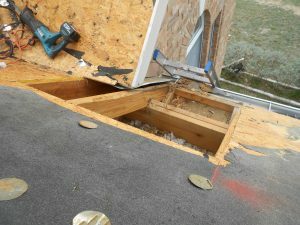 Since this was a critical point of failure, we replaced the previously rotted decking with new CDX plywood, and instead of felt roofing paper, we used a top-of-the-line ice and water shield material…PLUS custom flashing, fabricated in our metal shop. The finished project is now covered with shingles, and the house has a new roof…which is going to last twice as long as what was installed originally. While nobody else may ever know what went into this job, we’re satisfied that it’s a job done the way we’d want it done on our own homes. For any builder or craftsman, that ought to be the standard the buyer deserves. After every new roof installation, RoofCrafters inspects the job to ensure a quality installation. On shingle roofs, there are many factors that lead to a long-lasting roof. Nail placement is extremely important, as the location of the nail on the shingle can affect the life of the roof. 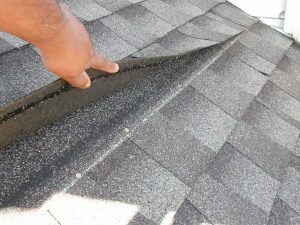 If nails are placed too high, the shingle could slide down the roof, placed too low and they may become a source of a future leak if not addressed. 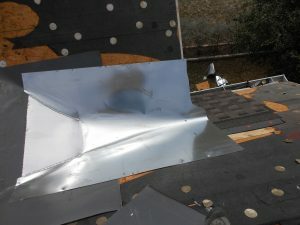 RoofCrafters also checks every pipe, vent, and piece of flashing to make sure it is installed properly, and that ice and water shield is used beneath the flashing for extra protection. 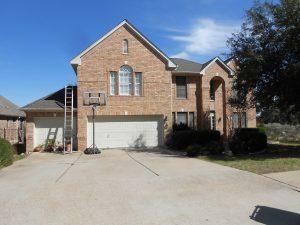 In addition, RoofCrafters will check inside the attic (when applicable) to make sure that heater and furnace pipes are connected after the re-roof process. Something that most roofers would overlook is addressed by RoofCrafters on every job.